All About Quail Hunting - Interested in quail hunting? 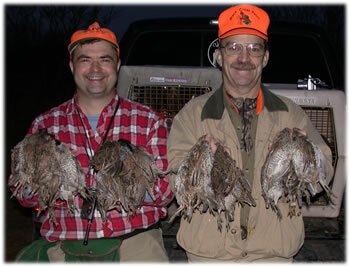 Quail hunting is one of the most exciting hunting sports available to the outdoor enthusiast. Whether you are hunting behind a brace of well trained bird dogs, or driving down ranch roads on a customized rig, the thrill of flushing a covey of quail can excite any hunter. If you are interested in enjoying the excitement of your own quail hunt, we can help. Visit our quail hunting packages or create a custom package for your self in our book a hunt section. We can help you set up a quail hunt you won't soon forget. If you are interested in leasing your land for quail hunting, or being listed on this site, please let us know. Send info about your lease to leases@ultimatehunts.com. Find out more about some of the common species of quail.